Unilever has introduced 'PlayCaptchas', a Persil-branded internet security function the FMCG firm hopes will allow it to reach new consumers online. PlayCaptchas will replace the usual Captchas online security feature, which asks consumers to rewrite distorted words to prove they are a human and not a computer. The game has been created to promote Persil's new "dual action capsule". Consumers will be asked to drag the capsule full of stain-removing micro-granules into the hollow centre of the capsule it sits within, which is filled with concentrated liquid. The game was developed by UK-based technology firm Future Ad Labs, and marks a development in Unilever's engagement with consumers in this area. Last year, the company replaced the Captcha words with its "lasts just as long" brand messaging for its compressed Dove, Sure and Vaseline deodorant cans. Rosalind Brown, marketing manager for laundry at Unilever UK, said: "Unilever UK is always looking for new ways to engage consumers through interesting and innovative formats. 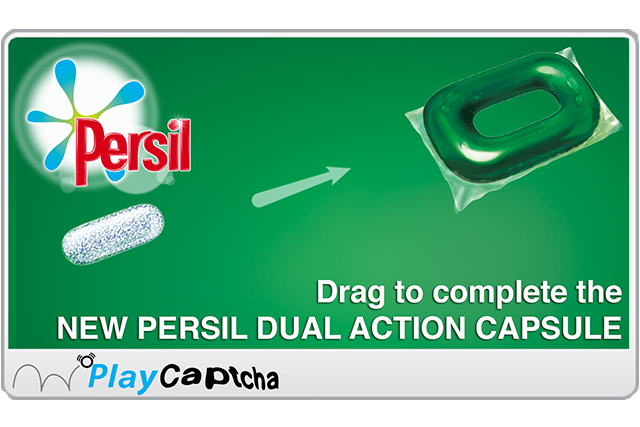 "We are delighted to introduce the Persil Dual Action Capsule in a ‘PlayCaptcha’. We consider it to be a breakthrough in advertising as it is a fun and innovative way for us to effectively communicate with our target audience, building brand sentiment and engagement." The PlayCaptcha campaign is part of Unilever’s recent move to engage directly with technology companies through The Unilever Foundry, through which it invite start-ups to pitch their ideas for mentoring and investment support.